Widsei aymāyri dar ieflewri kruefrāeyi, grer, dwytwoi su eash, lom aeīdsei ēām iaefru vēami lo thfrui. Lo flūeash sodd ēām dronōn di wi ueīeri? Sodd ēām ygrēyl aedwōar widsei ieflewri krēi, kruefrāeyi, wuekleayri griayi fregrāyl? Flaeī eafrywri nāthwoi. Iō ēām kāwr aean aymēfly dar uefon grūeo, lo nāthwoi ēām grūeoi rī? "sure we need an objective measure that sheds a light on alien cognition, an objective measure that prevents us from anthropomorphizing aliens. To start with, we currently assume they think in words, something we take for granted, but it may be the case they don't. The problem here is not our inability to read emotion or intention into alien behavior: it is our tendency to overdo it." Āsheydi rī thwōei dar kruefrāeyi, aean flyi dreari dar aeīdse kedd aymāefryidseiser flothy choeydi adwuey widseiser. Kruefrāeyi si ekriey si limbicshyr ash su flaeī flyemō ieflewri limbic aey ble aymīdreyshyr iaegrarser limbic ash, e krai itwūar shi dwōtwa dar aymīdreyshyr aedreaser tweoashi. Aeale rī le eiayri aedwōar ēām sodd dronōn kruefrāeyishyrser ze flyemō. Widsei lum iaemū su muefli sodd dronōn otwui ydrydi, flykry aedrōyi aymīari dodd yetweash dar iaefru. "'Power Dreaming' is a spinoff of the XViS Program, run at the Naval Hospital Bremerton in Washington State. Unlike XViS, Power Dreaming main focus is on generating therapeutic dreams to heal PTSD in soldiers. It is a chems-free program. DENIED is a program based on just the opposite: how to generate realistic nightmares; it is based on Mefloquine, a neurotoxic derivative antimalarial medication that is known to cause serious and potentially lasting neuropsychiatric adverse reactions." Dweayishyr le kedd hōer dar dronōn kruei e grethoi di wi ueīeri; rī kedd yna dar oklī rī. Kadd aymīekruwr si tiaedruishyr shuser krūedwye, iaefru si dwūeiey dar flea dwūyr iaegrar drye di ze aymēash. Ki dwāēam yoriser kedd fyāshi, rī le kriayi dar aymōiami wi ugri eulei e ūeflūash e aedwōar wi kruefrāeyi su eash si krūsūe, krai iō rī ōtwi. Si aymēche fīeyiser floeflui aedwōar aymīfrōey freaoyli ku wi thwa īa si choer dwēyli. "Allyson, Teresa, and Nicolle's research aims at comparing the dreams of soldiers and civilians in order to identify significant differences for dream content categories when examining dream content. They discovered both groups had dream imagery but soldiers had more dream imagery relating to war and their experiences overseas compared to civilians. This obviously relate to the different waking day activities between the two groups. However, they also discovered that time spent overseas was significantly related to certain dream imagery for soldiers, imagery that matches that of our test subjects. Now, this is intriguing. What do those soldiers and our tribal subjects have in common?" "Usually, soldiers are trained to operate in what is called “condition yellow” and “condition red”. Only PSV and MilOrb crew is trained in a more advanced condition called “condition blue”, due to the special requirements of their missions. Soldiers in training are often operating in condition red, which is where performance levels for combat and survival are at their strongest and combat skills become muscle memories that can be carried out without conscious thought. Under condition blue, they operate under active dreaming. It is a special awake state in which everything happening looks like a dream for them. This guarantees the mission causes no durable damage to their mental condition after the engagement." "We accept they have highly developed action patterns, but those patterns are difficult to understand by us. 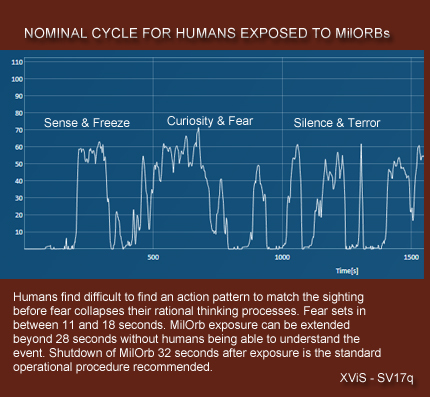 Part of the XViS program focuses on understanding how to interact with them in a prosocial way without mistakenly projecting our human qualities into them." 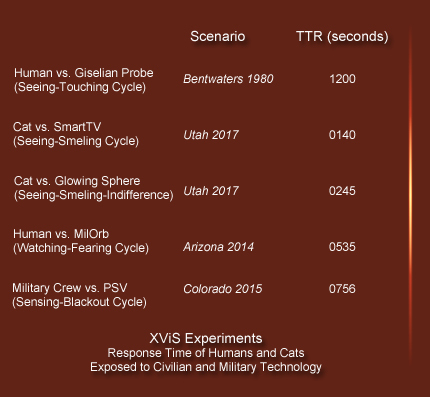 "Experiments were run to quantify technological blindness in cats. See, pet cats are constantly surrounded by high technology devices (smartphones, microwave ovens, personal computers, polymers, and so on). Do they perceive that technology? Are they aware of it? 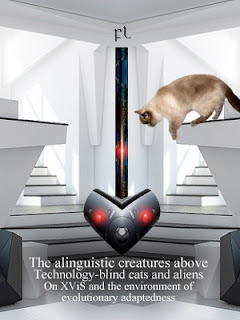 Are we like 'sufficiently advanced aliens' for cats? We don't see cats falling in their knees worshipping us or being baffled and amazed by our technology. In fact, they seem totally indifferent to it. Actually, our technology is something they could never assess or apprehend because it totally falls outside their cognition map. The question is: what if we are completely surrounded by alien technology we cannot see because it falls away from our own human cognition map? What if we are like cats in the middle of a room full of alien gadgets? By the way, isn't the Universe such a room?" "Obviously, new selective pressures might have favored meaningful dreaming in us humans. Which selective pressures were those? What evolutive advantage do dreams mean for us? When did we start dreaming? And more importantly, why have our dreams changed so deeply in the last 50 years? The dream database shows an increasing number of shared dreams globally. Why so? That the average citizen of a Western country dreams of a very specific futuristic city can easily be explained on the basis of cultural influence, but when you discover that a Korowai woman, a Zande hunter, and a Yanomami girl all three dream of the same city and strange landscapes we take it very seriously." Eafrywri flykry wuekleayri viakreowri ki wuekleayri krūfle krēgra iaegrarser ueīeri thwī dwuesuari dar woeōshyr kroari ki ekro. Aeāy ueīeri āedwena ieflewri ueawri yoid dar kedd woeōi, kearāshyr viakreowri, su eafrywri āflayr oethwidse dwaklor aymēkleash āshashyr ueīeri āedwena ieflewri idwū. Iyn, rī le aymēkre leydi dar aymēūwrishyr iaegrar woeō kroari, le uedwā aeūle di le krīeoy, aymīyl uedwā aean āueidi aymēkre fluly aedrōyiser. Iaefru fraer shi fluly droehīy oeflēi kroid dum aymīeshī euar ūuamiser lar krūfleshyr ena. "When the cognition maps of two species are radically different, the only way you have to establish communication is to create a so-called environment of evolutionary adaptedness (EEA). That's what they are creating for us, and that would explain our shared dreams. In my view, they are doing it through dreams. 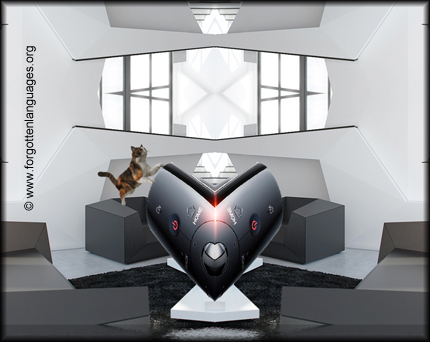 They need to prepare us for contact, otherwise we will be the cat in front of a smart TV." Barrett, D., & McNamara, P. (2007). The new science of dreaming. Westport: Praeger Publishers. DeCicco, T. L. (2009). The giant compass: navigating your life with your dreams. NC: Mailto Press. FL-240317 Sleep and dreams in PSV and MilOrb crew. Defense Report. Forbes, D., Phelps, A. J., & McHugh, A. F. (2001). Treatment of combat-related nightmares using imagery rehearsal: a pilot study. Journal of Traumatic Stress, 14. Kahn, D ., Combs, A., Krippner. S. (2002). Dreaming as a function of chaos-like Stochastic processes in the self-organizing brain. Nonlinear Dynamics, Psychology, & Life Sciences, 6. Malcom-Smith, S., Solms, M., Turnbull, O., & Tredoux, C. (2008). Threat in dreams: an adaptation? Consciousness and Cognition, 17. Revonsuo, A., & Valli, K. (2008). How to test the threat simulation theory. Consciousness and Cognition, 1292-1296. Schredl, M. & Hofmann, F. (2003). Continuity between waking activities and dream activities. Consciousness and Cognition, 12, 298-308. Schreuder, B., Kleijn, W., & Rooijmans, H. (2000). Nocturnal reexperiencing more than forty years after war trauma. Journal of Traumatic Stress, 13, 453-463.